I just did a month without makeup. That’s no big feat to many women. However, as a self-confessed beauty junkie and amateur makeup artist in times gone by, this no makeup challenge was a big deal for me. With the exception of times when I’ve been horrendously ill, I’ve worn make-up pretty much every day since age 13 when I first developed acne and plastered makeup on in the hope it would conceal all my angry flare-ups. I’m now 26. The years have gone by since the troublesome teens, and thankfully, my skin has cleared up. At 18 or so, I fell in love with makeup for the creativity that came with it. Using my face as a canvas, I could transform it, enhance it, color it, and trick the eye. But my love affair stretches far further than a confidence-boosting sweep of liner. If there’s ever an excuse for costume makeup, I’m there full steam ahead. But with all this said, I thought I’d take on a no makeup challenge and go bare-faced for a full month. I did it out of curiosity more than anything. The initial idea made me automatically exclaim (on the inside) “Pfft! I don’t need to do that. 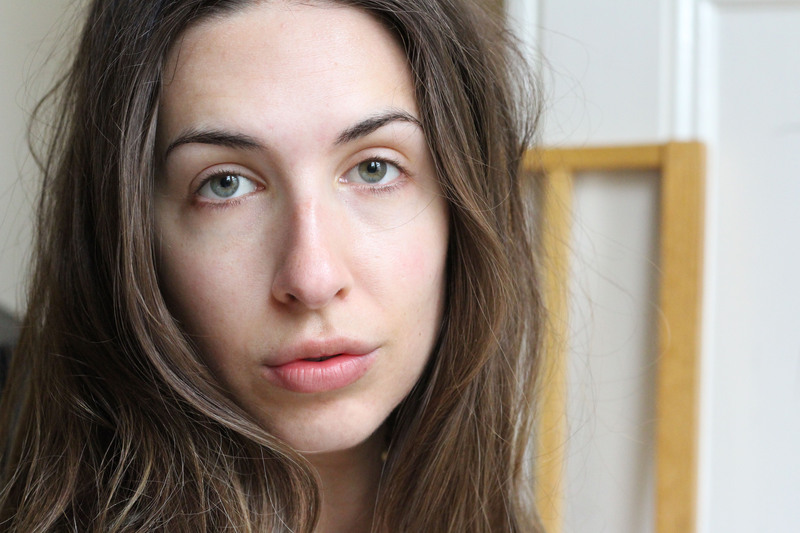 I’d be fine without makeup.” However, this knee-jerk reaction made me stop in my tracks. I then prodded, as I do when there’s an opportunity for self-discovery. Why was I so quick to automatically write off this no makeup challenge? What was I so scared of? In the quest for self-discovery and perhaps learning an important, lifelong lesson, I embraced my no makeup challenge with wide, open arms on Day 1. How was this going to turn out? Would my confidence be affected? Would I feel liberated? Would I decide to never adopt a fully made-up face again? There were so many questions and only time would tell. The first couple days of the no makeup challenge were easy. I was away hiking with friends–guy friends–who don’t care about or notice these things. This was good. That weekend passed, and the days turned into work days, then leisure days once more, and no one said anything. When it did come up in conversation (because I offered it up) I was consistently met with, “oh, you don’t need it.” Sure, this made me feel nice. But what those folks didn’t realize is that I didn’t wear make-up as a mask. I wore it as a form of creative self-expression. I didn’t care whether I needed it or not. I wore it for fun, for pleasure. But I must admit it was nice as time wore on being able to normalize my bare face. Quite quickly after I started the challenge, I noticed that it was nice to look in the mirror and spot the features that I liked about myself and take pride in them for how they looked–no make-up required. The days turned into weeks and everything was fine. That was, until the great break-out happened. To give some background to this–if there’s one thing I pride myself on, it’s my ability to pack lightly when I travel. I genuinely impress myself each time I head out of town and somehow my bag has shrunk and lightened. I consider it an art form. But I took a step too far on a recent trip. Silly me; I thought it would be a great idea to pack one bottle of cleanser that was a supposed “do it all” for hair, body, and face. That last zip of the suitcase sealed away my tiny bag of cosmetics. I looked at that all-in-one and I felt proud. Then it happened. I washed my face in the shower and felt a squeaky-clean sensation that not only didn’t feel comfortable, but made time slow down. I felt the regret seep out of my pores instantly. I could almost hear Caroline Hirons crying out in agony all the way from London. But it got worse. I persisted. I decided that despite the sqeaky-clean, this would surely do the job. I mean, it’s a natural, organic brand, so surely that wouldn’t aggravate my skin? Wrong. By the third day of using this cleanser, waking up with yet angrier, redder skin, I decided that enough was enough. I evicted it from my already bare cosmetic stash and decided it’d be reserved for body-washing only. Man face wash it was. Surely it had to be better? A few days passed and my skin was on the mend, but it was interesting how my confidence plummeted while I had that flare-up. “They’re all staring at me,” I thought to myself. That was until I stopped and had a reality check. How self-involved was I? As if that random pedestrian is even looking at me. As if he or she cares! This soon made me feel better. I think in times like these, we need to remind ourselves that no one scrutinizes our face quite like we do. (Apart from maybe your dermatologist, but that’s what you pay him or her for, right?) Those that see you, see you, for all that you are–not the imperfections that blemish your face from time to time. By the end of the month-long no makeup challenge I was itching to get my face back again. My made-up face. Wearing makeup is a part of who I am and how I express myself. It’s really no different than coloring your hair or dressing in a certain style. I don’t think women should be made to feel ashamed for wanting to wear makeup – and lots of it if that’s what makes them happy. It is an art and it is a beautiful one. What is your relationship with makeup? How easily could you do a month-long no makeup challenge?